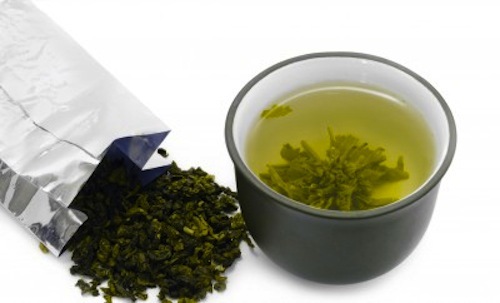 Green tea is rich in a group of antioxidant known as catechins. Antioxidants are important for neutralizing free radicals that we absorb form the environment and that can damage DNA, leading to tumor formation. Epigallocatechin-3-gallate (EGCG) is the most common catechin in tea leaves; it is found in green tea but not black tea, because the oxidation process used to make black tea destroys it. The new study was based on a number of premises. First, there is epidemiological evidence that green tea consumption is inversely correlated with the incidence of Alzheimer’s disease, Parkinson’s disease, and dementia. Next, work done in animals suggests that EGCG protects against age-related cognitive decline. And last, it is known that new nerves can be generated in the hippocampus, even in adults. The hippocampus is a region of the brain important for consolidating short-term memories into long-term memories, and it also plays a role in spatial navigation. The generation of new neurons in the hippocampus, a process called hippocampal neurogenesis, declines with age, and this decline is associated with neurodegenerative diseases and the memory problems and disorientation that accompany them. Thus, the researchers wanted to see if EGCG might alleviate neurodegeneration by promoting hippocampal neurogenesis in adults, and if so, how. They applied EGCG to murine neural progenitor cells growing in dishes and found that EGCG enhanced the proliferation of these cells. When they isolated hippocampal neurons from adult mice that had been injected with ECGC, they found that those cells, too, grew more than cells from mice who received a control injection of saline. Moreover, the mice who received an injection of ECGC exhibited improved spatial learning and memory; treated mice found a hidden platform more quickly than control mice. When they looked for the molecular modulator of ECGC’s ability to stimulate neuronal growth in the hippocampus their attention fell upon sonic hedgehog (SHH), a protein vital in both the development of the brain during embryogenesis as well as maintenance of neural progenitor cells in the adult brain. And yes, it is named for the video game character. It turns out that ECGC increases the amount of sonic hedgehog, as well as some of its interaction partners, in hippocampal neural progenitor cells. An inhibitor of sonic hedgehog signaling partially blocked ECGC’s ability to promote neuronal growth, strongly suggesting that ECGC uses sonic hedgehog to exert this activity. The authors note that ECGC is being considered for use as a preventative and therapeutic agent in the treatment of neurodegenerative disease, and their findings that ECGC helps promote adult hippocampal neurogenesis by signaling through sonic hedgehog certainly supports this course of action. Although much of the evidence for green tea’s potency comes from laboratory studies such as this one, rather than human clinical trials, they also suggest that drinking green tea can have positive effects on cognition. Just don’t put milk in it; the proteins in milk, be it from a cow or a soybean, bind to ECGC and reduces the body’s ability to make use of it . Wang et al. Green tea epigallocatechin-3-gallate (EGCG) promotes neural progenitor cell proliferation and sonic hedgehog pathway activation during adult hippocampal neurogenesis. Mol Nutr Food Res. 2012 Aug;56(8):1292-303. doi: 10.1002/mnfr.201200035. Epub 2012 Jun 13.